The shrubby cinquefoil is a shrub that features flowers much like those of their relative, the strawberries. The blooms can be white, yellow, orange or pink. This shrub is Potentilla fruticosa and is a member of the Rosaceae (Rose) family. There are thousands of familiar species in this family including roses, the Prunus fruits, strawberries, Rubus spp. berries, cotoneasters and hawthorns (Crataegus spp.). You may sometimes see it written as Dasiphora fruticosa. You may see this called shrubby cinquefoil, golden hardhack, shrubby potentilla, yellow rose, bush potentilla, bush cinquefoil, widdy and potentilla. This subshrub does well in sites located in Zones 2-7. It is native to Asia, Europe and North America. The shrubby cinquefoil will reach a height of 1-4' tall and a width of 2-5' at maturity, forming into a rounded shape. The shrubby cinquefoil may be planted in locations with full sun or part shade. You will get more flowers if you can plant it where the shrub will receive full sun. Choose this to add a fine texture to your yard. The leaves are pinnate with 3-7 blue-green or dark green leaflets. They change to a yellow-brown color in the fall before falling off. The total length of the leaf is 1" on average. 'Abbotswood Silver' has variegated leaves. The five-petaled flowers appear in June and keep blooming until the first frost hits. They are very similar in appearance to their cousins, the strawberries (Fragaria spp.). It is typical to see yellow varieties planted, but the color palette has been expanded through the development of new varieties. The fruit produced is a brown achene. These shrubs are dioecious and you will need both male and female plants if you plan to collect seeds. The shrubby cinquefoil is an excellent choice for cold climates where many other plants struggle or die. This plant can be a great way to pop some color into your drought tolerant garden. These shrubs are perfect for use in mass plantings and borders. 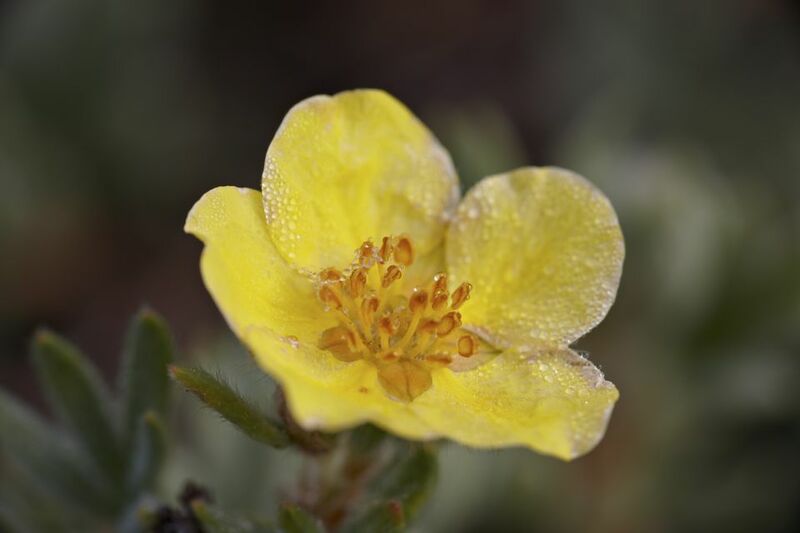 Shrubby cinquefoil can grow in a wide variety of soil pHs and textures. They can tolerate poor soils. The best growth happens in soils that drain well. Propagation may be done by cuttings, seeds and tissue culture. Prune during the winter to help keep this subshrub rounded.